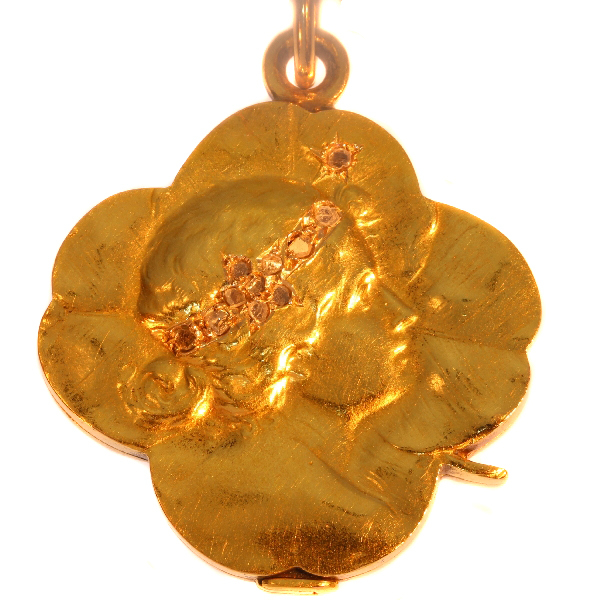 Art Nouveau gold slide locket four leaf clover with woman head: Description by Adin Antique Jewelry. Style specifics: Art Nouveau - The floral ornaments and botanical designs are very typical for the Art Nouveau style. Diamond(s): 11 senailles . A senaille is a simplified rose cut diamond, a small diamond chip with perhaps a few polished facets. We do not have the weight of these diamonds which is normal in our trade when it comes to senailles.